Iconic UK haulage firm deploys Dell Boomi tech to improve processes and avoid downtime. One of the UK's most iconic firms has revealed it will be working with Dell Boomi to modernise its operations and kick-start its digital transformation. Eddie Stobart, whose lorries and trucks are a common sight across UK motorways, will be using Boomi’s integration platform as a service (iPaaS) to help dramatically improve the operations of its B2B trading partner network and bring greater speed, flexibility and efficiencies to its entire business. The company currently operates around 2,500 vehicles out of 26 distribution centres around the UK and Europe, but had been held back by a lack of agility and flexibility in its technology stack. “We needed a platform that was agile, flexible and able to respond to customer preferences and constraints,” said John Court, CIO at Eddie Stobart. “As an always-on business, high availability was critical to us, but it had to be cost-effective. Being in the third-party logistics space, it is imperative that we deliver in a dynamic fashion that allows us to adapt to the changing needs of our customers. Dell Boomi makes it possible for us to do that quickly and efficiently,” he added. Thanks to Boomi, the company has already cut its warehouse integration project timelines, which previously could take as much as 26 weeks, in half. Eddie Stobart was also able to cut the number of existing vendors it worked with down to a fraction of the previous amount, streamlining processes and cutting costs. The platform has also helped improve workflows for customer orders, logistics management and enterprise operations, benefitting both Eddie Stobart and its many customers across the UK. “We’re proud to have supported Eddie Stobart transform its digital infrastructure. Underpinned by our integration platform as a service technology, the company has seen the benefits of building a more agile, connected and customer-centric business,” said Derek Thompson, VP of EMEA, Dell Boomi. 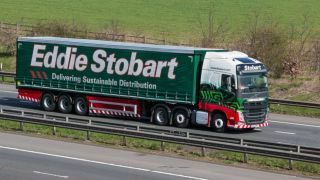 “Eddie Stobart has not only dramatically improved its agility and control in onboarding and managing trading partners but also improved the service it provides customers, supporting the business’ ambitious growth and development plans,” he added.